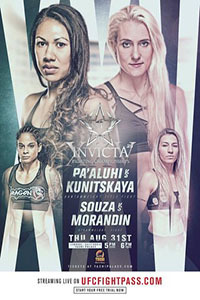 • Yana Kunitskaya vs. Raquel Pa'aluhi: Yana Kuniskaya def. Raquel Pa’aluhi via unanimous decision (50-45, 50-45, 50-45). • Katharina Lehner vs. Alexa Conners: Katharina Lerner def. Alexa Conners via TKO (punches) at 4:21 of Round 1. • Sarah Kleczka vs. Amberlynn Orr: Sarah Kleczka def. Amberlynn Orr via split decision (28-29, 29-28, 29-28). • Shaianna Rincon vs. Courtney King: Shaianna Rincon def. Courtney King via TKO (strikes) at 3:41 of Round 2. • Cheri Muraski vs. Tracy Cortez: Cheri Muraski def. Tracy Cortez via submission (guillotine choke) at 2:42 of Round 2. • Jillian DeCoursey vs. Ashley Medina: Jillian DeCoursey def. Ashley Medina via split decision (28-29, 29-28, 29-28).